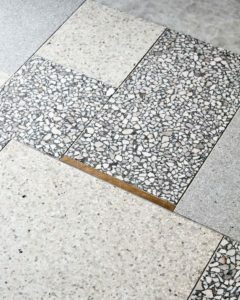 For so long confined to utility spaces such as bathrooms, kitchens, laundries and outdoor areas, the floor tile is now having its moment in the sun and it is now entirely acceptable to lay tiling in every room in your house, including bedrooms and living rooms. There are some fantastic designers to discover who are having fun using a variety of materials – many at the luxury end of the scale – and experimenting with patterns that range from twists on the traditional to bold and contemporary motives. 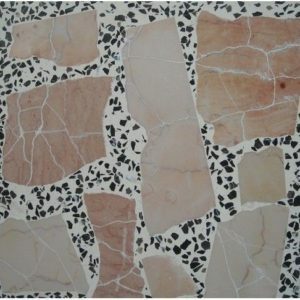 So much so that, today, the choice of floor tiling can really set the tone for the character of a room. 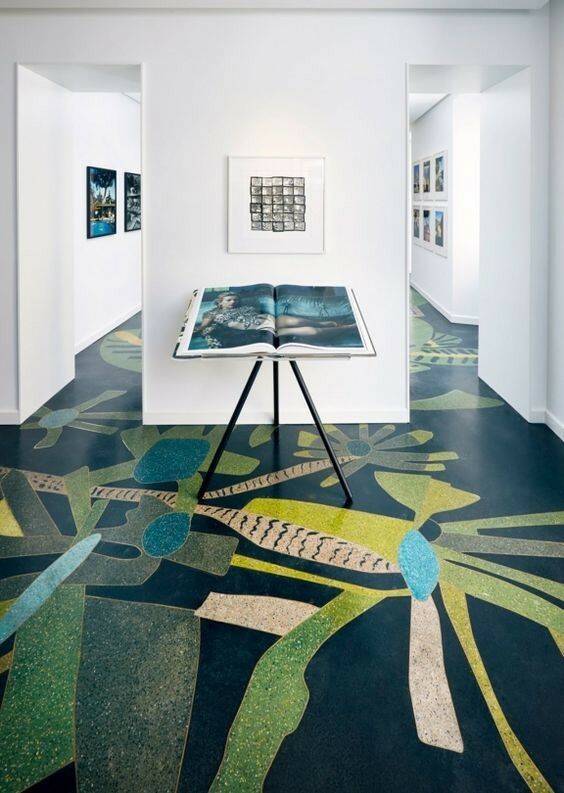 Our only advice – if you choose a statement tile to create your interior flooring designs, make sure it is the stand out feature in the space it occupies. 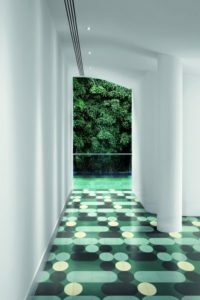 This breathtaking flooring found inside Toby’s Estate Café in Sydney’s Darling Harbour mixes dark green stone and black, green and white marble. While the design successfully creates the impression of bringing the outdoors in, it also has an old-school treasury aesthetic; done deliberately as the café is housed inside the headquarters of one of Australia’s leading financial institutions. Designer: Studio Tate and Yellowtrace. Durable and easy to maintain, Terrazzo is a wonderful flooring canvas that can be composed of a variety of materials including quartz, mother of pearl, porcelain, recycled glass and mirror chips. We love the effect created when marble meets shattered granite in this superb example from Iranian manufacturer Persiana Stone. The finished product is a distinctive design that evokes the tradition of the age old method yet is also thoroughly contemporary. Book lovers and design enthusiasts around the world love this German art and design publishing house for its vibrant and captivating coffee table tomes and it’s no surprise that its stores are utterly distinctive and suitably flamboyant. Note the bare white walls and the understated, framed images: this is a space where the floor tiles are the lead character. Although every room has its own distinctive design, it is this terrazzo flooring delineating shimmering Californian flora and fauna in blues, greens and yellows, that really wows. We can’t imagine a more fabulous interior flooring design to start conversation in your home than these amazing liaison floor tiles by Kelly Wearstler for Ann Sacks. 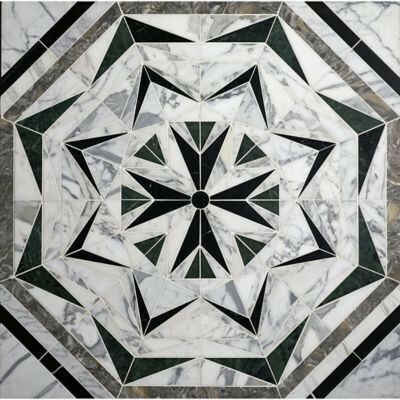 A mix of stones and geometric shapes, this is the definition of statement tiling. Make it work in a hallway or a reception space. Pierre Mesguich is a French mosaicist who blends traditional techniques with modern styles. 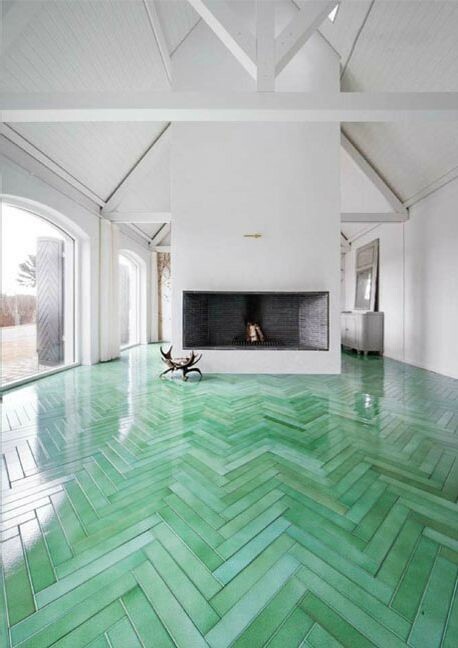 His original patterns really encapsulate just how unique and exciting interior flooring design can be. This wonderful marble circle is also bang on trend as swooping art deco inspired circles are making a big comeback. It would appear our happy place is located down under, on the streets of central Melbourne to be precise. Australian interior designer Fiona Lynch has privileged materials such as stone and concrete to create a stripped back and functional, yet oh-so stylish, interior that is utterly fitting for the raw juice bar and healthy bowl café that inhabits it. A building dedicated to modern art can hardly be conservative itself, yet here in the Museum of Modern Art in Germany, the space becomes as much as an attraction as the art housed inside. 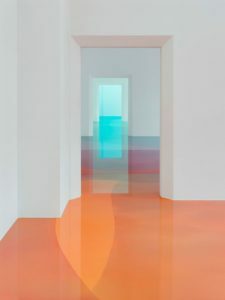 Artist Peter Zimmerman has created a wonderful mix of traditional art exhibition and an experiential show by redesigning the floors into shimmering floods of resin across almost 425 square metres. We are blown away by this wonderful abstract art. While the glass mosaics and ceramic tiles of Iranian architect, designer and scenogropher India Mahdavi need no introduction, it is her work with cement that has really captured our attention here. The fantastic geometric patterns and use of a fresh palette makes this space playful and modern. Each tile is made by hand, pre-treated with a protective water and oil repellent, and finished with a wax coating. 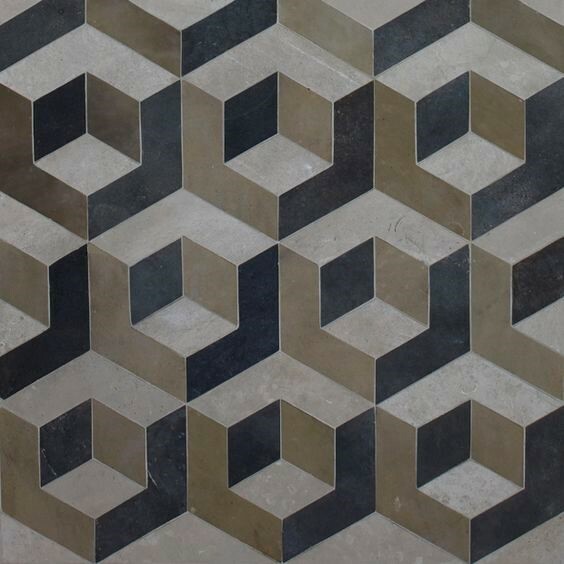 Reclaimed tiles and antique floors are wonderful for evoking mystery and hinting at illustrious pasts and these genuine antique British reclaimed Geometric Jones tiles from Lapicida simply nail the look. 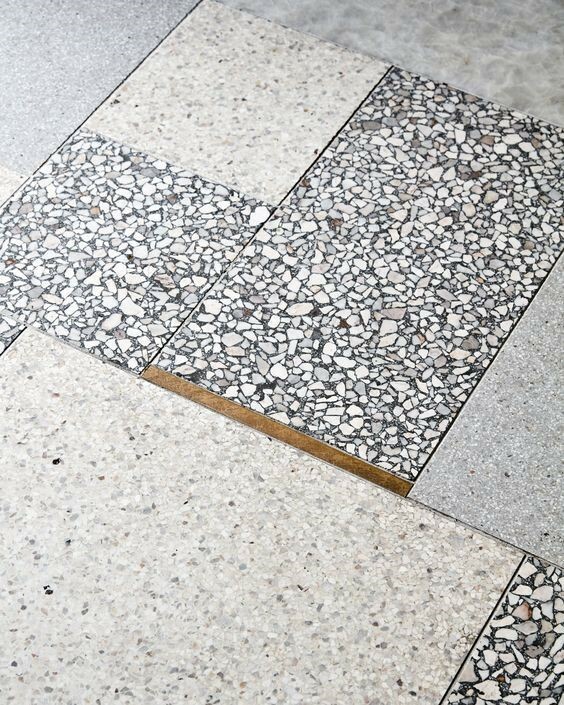 Guaranteed to draw attention in any room, this is a versatile choice which can be used as both interior and exterior flooring. The Cristalli collection from Danish and Italian designers Made a Mano – made by hand in Italian – manages to be both extremely elegant and courageously colourful at the same time. The material, pearl crystals, is what gives this range such an original look – and fabrication. The crystals are poured over the tiles and brushed out by hand, which means that every tile is unique.